I’ve taken on a full CSA share this year. This is an ambitious quantity of vegetables, even for a serious vegetable lover. My goal is to keep some staples on hand that will allow me to convert pretty much anything into a quick weeknight meal. 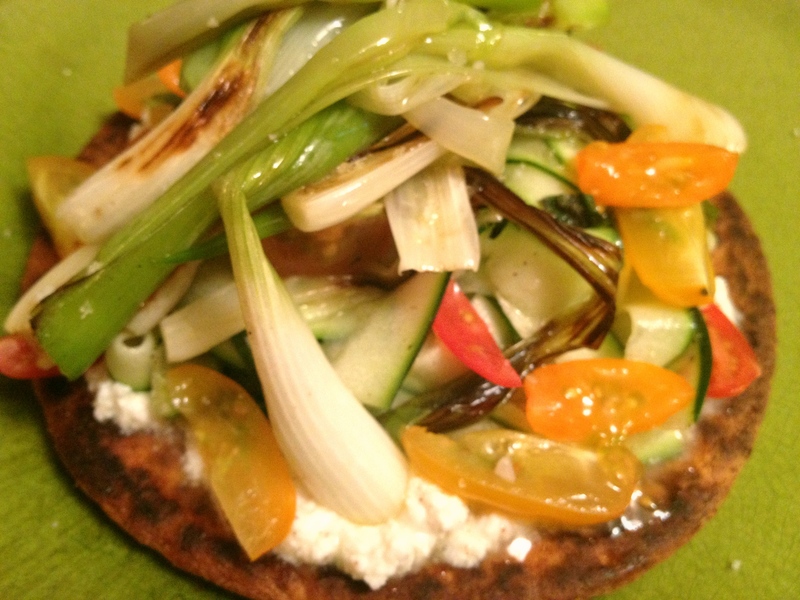 Whole wheat flatbread and ricotta cheese are on the list. Tonight I seasoned the ricotta with nutmeg. I used a vegetable peeler to shave thin slices of zucchini and marinated them in lemon juice, fresh basil and a fruity olive oil. I topped it off with a few sliced cherry tomatoes and some scallions that I halved and grilled in the same cast iron pan that I used to toast the flatbread. When making something this simple, it’s important to season each element. I added salt and pepper as I went and then sprinkled a little fleur de sel over the top. I ate this with some green leaf lettuce dressed with Greek yogurt, white wine vinegar, a minced garlic scape, pepper and a bit of honey. For dessert I polished off some strawberries that were definitely not going to keep through my long weekend in Sonoma. Then I turned a bag of leafy greens over to my appreciative neighbor and dragged out the suitcase. That last margarita was definitely not necessary. I awoke this morning to a trail of clothes leading from the front door to the kitchen, where I had stopped off to grab a glass of water before planting my face in a pillow. Note that I did not actually drink the water, despite the advice of the drag queen in house slippers who read our palms on a dimly lit street corner somewhere in the West Village. But that’s another story. Something healthy and restorative was in order. Heat a cast iron skillet to medium-low with half a tablespoon of butter and a thinly sliced garlic glove. Cube a slice or two of stale bread. (I had some sourdough rye on hand.) Add the pieces to the skillet, stirring to coat. Add some salt and pepper, turn the heat down to low and stir occasionally while you continue your preparations. If you have not figured it out yet, the goal here is quick croutons. Toss the following ingredients into a food processor or mash together with the back of a fork: 3 anchovies (I used sardines because I had an open tin), juice of 1 lemon, 1/2 tablespoon Dijon mustard, 1/2 tablespoon mayonnaise, 1 clove garlic, pinch of cayenne, pinch of sugar, black pepper. Rinse and finely shred your kale. I went with some young lacinato, which is also known as dinosaur kale, that I got in last week’s CSA share. Add the kale, dressing, croutons, some grated parmesan or romano cheese, and a pinch of smoked sea salt if you’ve got it. 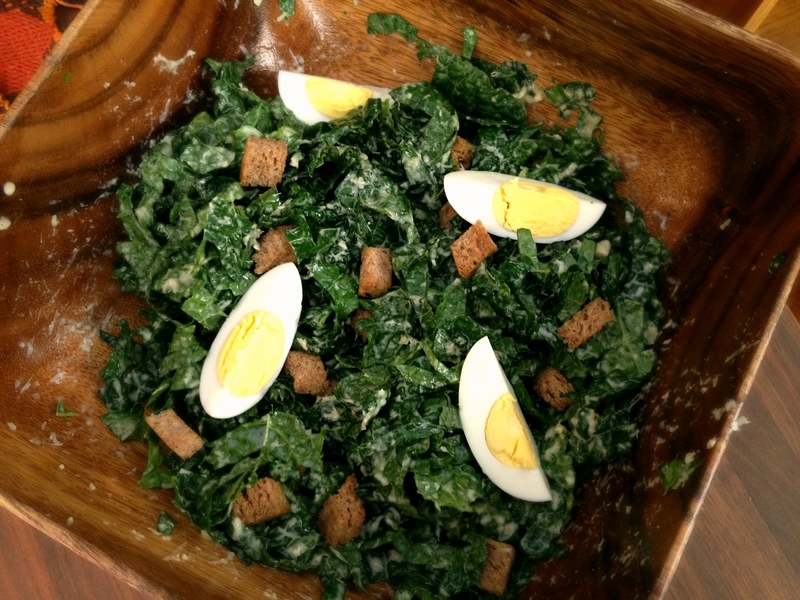 Toss the salad and add your peeled, sliced egg. This plus an iced coffee and I am feeling a good bit better. Now if I can just figure out how to get the remaining glitter off of my eyelids before this afternoon’s babysitting gig. 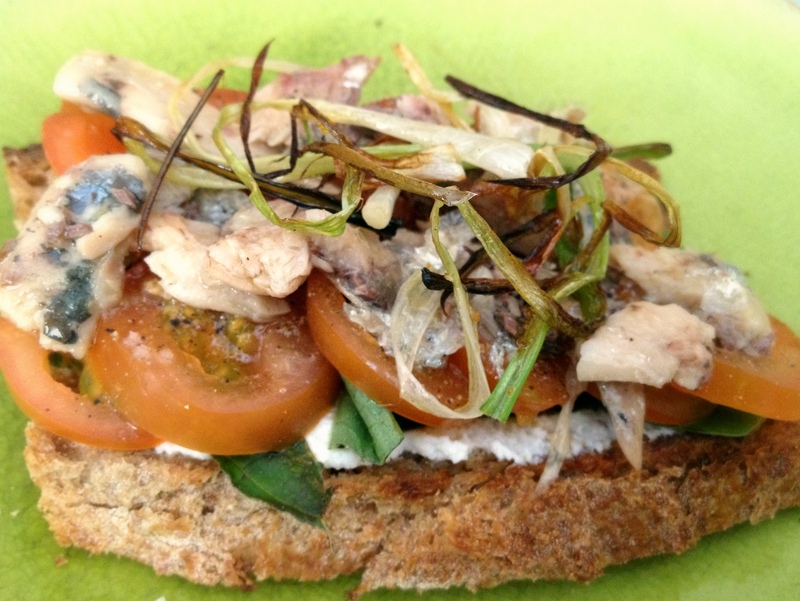 Grilled rye sourdough, ricotta, basil, cherry tomatoes, fleur de sel, black pepper, oil-cured sardines, frizzled scallions. In that order. Pairs nicely with an iced coffee when it’s 85 degrees at 10am. Yesterday was the summer solstice. Here in New York City, we hit 97 degrees though it apparently felt like 102. Con Edison warned of likely power outages. My coworkers and I did our part by working with the lights off, which had a calming effect on an otherwise nutty day. I worked late, but it was still steamy by the time I got off the train in Brooklyn. It was 8:00 and I was hungry, but there was no way I was creating any more heat in my stuffy apartment. Combine all but the last two ingredients in a jar and shake vigorously. Then combine with the chickpeas and red pepper in a bowl. Now root around the fridge and pantry and see what you’ve got. 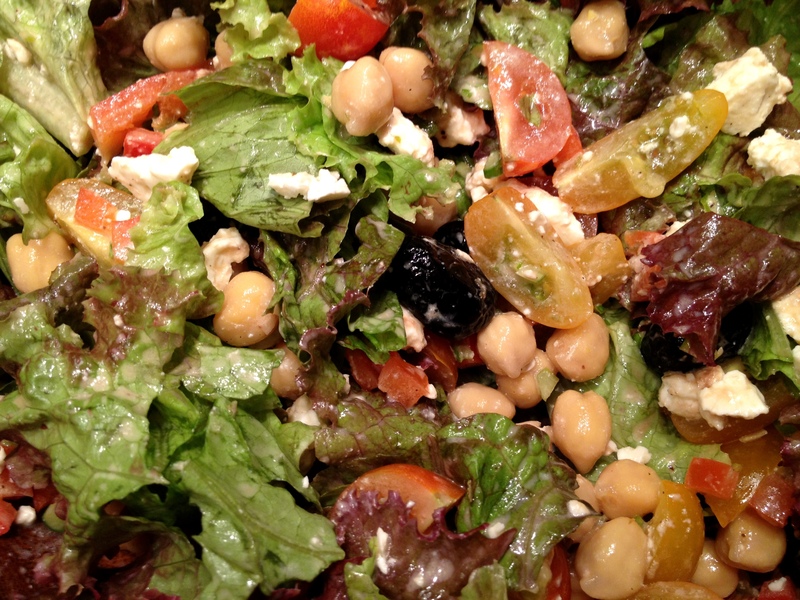 I had some red leaf lettuce, baby heirloom tomatoes, feta and oil-cured olives. Hearts of palm or artichoke hearts would have been an excellent contribution from the pantry. Pack half of your lightly marinated chickpeas away for a future snack, toss everything together in a wooden bowl, and grab a fork. I find that salad for one is best eaten directly out of the bowl. Midway through my meal, there was a gentle rap at the door. I grabbed my trusty wooden bowl and the remaining strawberries and joined my neighbors on the roof. The sun was just finishing its descent and there was a cool breeze in the air. Wine was poured. Plants were watered. Berries were eaten. And thus concluded the longest–and perhaps hottest–day of the year. 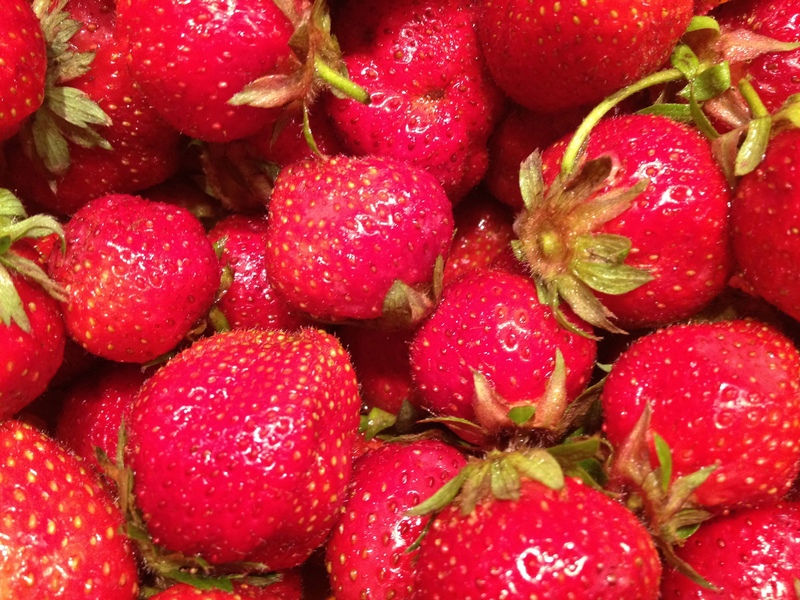 Pick up one quart of strawberries from CSA and take them home. Put strawberries in colander and rinse gently. Eat strawberries standing at the kitchen counter. Yes, the whole quart. At some point, you may conclude that wasting even a bit of the perfectly ripe flesh around the stem is unacceptable and just pop the strawberries in your mouth whole, leaves and all. This is a reasonable solution. This week continues to be challenging. I didn’t make it home until around 9:00 last night, by which time I was ravenous. I keep corn tortillas on hand for just such a situation. A few tortillas, half a tablespoon of olive oil, a red onion, a sweet red pepper, a jalapeño, some feta and the less brown half of an abandoned avocado became my dinner in about 15 minutes. 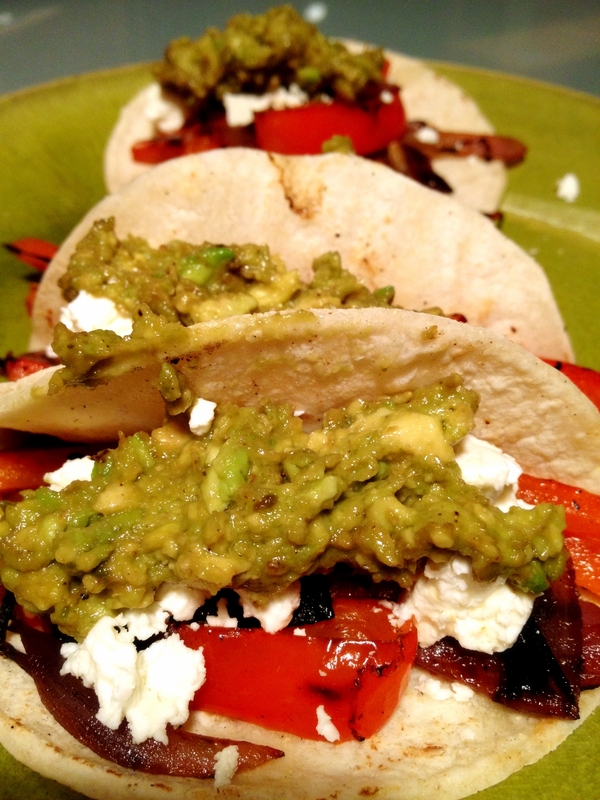 The tacos were tasty but, in my haste, I forgot a few key tips for working with chile peppers. Cut off the tip and taste to assess hotness. Each pepper is unique. I’ve had jalapeños as mild as a green bell pepper. I’ve had jalapeños that were scorching. Let’s just say that my lower lip is looking a little bee stung today. If the pepper is hot, minimize skin contact. When you cut a pepper, you release capsaicin, the chemical that creates that delicious hot feeling. The more you cut it, the more you release. Some folks recommend wearing plastic gloves. I used to think this was ridiculous–until I met some seriously hot habaneros while making black bean dip. My hands stung for about 24 hours and were tingly for a few days after that. I tried milk. I tried oil. I tried vinegar. I tried harsh detergents. Nothing but time worked. I have yet to buy gloves, but I do make an effort to only touch the outside of the pepper and let my knife do most of the work. If your hands do absorb the heat, BE VERY CAREFUL what you touch. You can generally gauge whether one of your fingers is tainted it by sucking on it a bit. You could also gauge this by removing your contacts or by touching some mucus membranes (think soft, fleshy pink parts), but I DO NOT recommend this technique. If you want to minimize the heat, remove the ribs (the white part on the inside) and the seeds. If you are in a hurry and do not bother with this, you may end up with some very zesty tacos. Obviously, if you really want to amp your dish up, go for the whole thing. Using multiple sources of heat will yield a more complex flavor. In the case of these quick weeknight tacos, I stuck to the jalapeño and some fresh-ground black pepper. But, when I’m making chili or some other slow-cooked dish with layers of flavor, I generally go with a combination of fresh and dried chiles, chile powder, and/or hot sauce. Use caution when cooking chile seeds. If you’ve got a soup or a stew or some kind of braise going on, no worries. If you’ve got a hot cast iron pan with minimal oil, you may end up burning the seeds. If you live in a small one-bedroom apartment with no cross ventilation, this could be rather unpleasant. Boys and girls, can you say “pepper spray”? By Monday afternoon it was clear that this was going to be a rough workweek. I made it home by 8:00 the next night, but I still had some urgent work to do. And I was seriously hungry. In the crisper, I found some (slightly moldy) turnips, carrots and a garlic bulb that were left over from a trip to the farmers market a few weeks back. I could work with this. 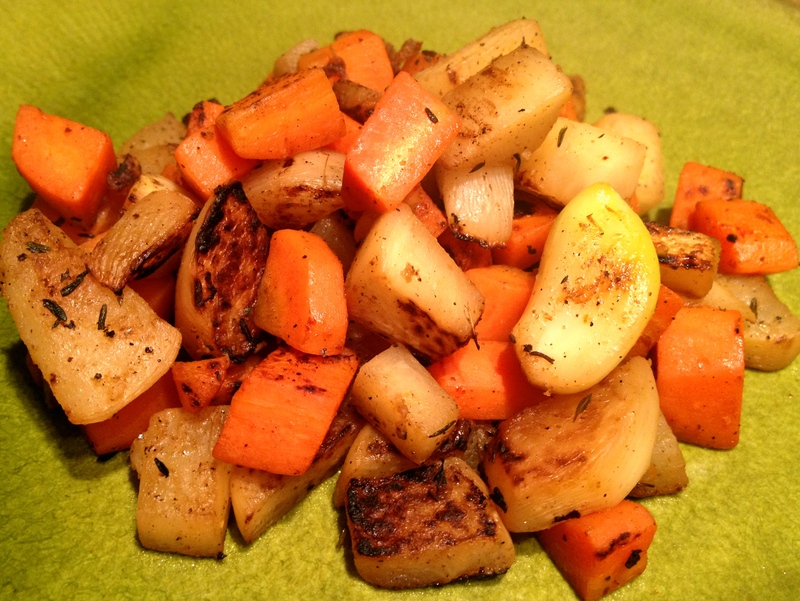 Most home cooks know how to roast root vegetables in the oven. (Toss the vegetables in olive oil, salt and pepper; spread them in baking pan; and roast at 400-450 until they are cooked.) But sometimes it’s just too hot or you are just in too big a hurry to consider turning on the oven. Here’s a basic technique for roasting root vegetables on the stovetop. Bring a cast iron skillet up to medium heat with just a little oil. In this case, I used a tablespoon of olive oil. Add your aromatics. I used six whole peeled garlic cloves, which I toasted in the oil until they were fragrant and starting to brown. You could also use onion, shallots, garlic scapes, leeks, etc. Dice your roots and add to the pan. I used three medium turnips (with the moldy bits cut off) and seven carrots, which yielded enough food to pack away an extra serving for some future food emergency. You could also use rutabaga, potatoes, beets, parsnips, any hard squash, yams, fennel, and probably a bunch of other things I’m not thinking of. Stir occasionally. You want to allow each piece prolonged contact with the cast iron to promote delicious crispy bits. This also allows you time to log into your work email and put out a few fires. Add seasoning. I used sea salt, cayenne, black pepper and dried thyme. Fresh herbs would be nice–rosemary, parsley and the like. Make it a meal. The cupboard is pretty bare at the moment, so I went with a frozen Boca Burger that had seen better days. A piece of sausage, a turkey burger or a fried egg would work. Just push your vegetables to one side of the pan to make room to cook your protein and you’ve got some seriously easy cleanup! Thirty minutes after walking in the door, I had finished work for the night and was sitting down to a healthy dinner. And lo, there was a glass worth of Vouvray left in the bottle.